An important turn today for UK Assisted Dying supporters (which is about 62% of the public…). 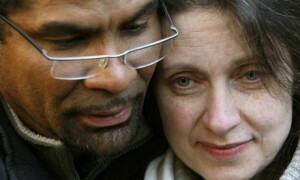 Debbie Purdy successfully argued that it would be a violation of human rights for her to not know whether her husband would be prosecuted for accompanying her to the Swiss clinic Dignitas, where she wishes to die if her multiple sclerosis worsens. aids, abets, counsels or procures the suicide of another, or an attempt by another to commit suicide, shall be liable on conviction on indictment to imprisonment for a term not exceeding fourteen years. What that aiding, abetting, counseling, and procuring entails is really ambiguous. It is all so unclear that UK Prosecutors have been declining to press charges against families that accompany, say, a loved one to die in the Dignitas Clinic. For an extremely thorough history on the Assisted Dying debate in the UK, see the Guardian’s Assisted Suicide page. I discussed much of this information a few weeks ago in a Death Reference Desk post about the recent deaths of Edward and Joan Downes. Since the Downes’ deaths and that discussion, I came across the following article: ‘Romantic’ death may idealize suicide: critics. Maybe. But I’m not so convinced. If anything, what Edward and Joan Downes chose to do was die and to die together. It was an act of love, to be sure, but I’m not ready to call it romance. They chose death over a biological life neither one of them wanted to live. It is absolutely acceptable to choose death. And family members and/or friends who want to assist in that choice should be able to do so without fear of the law. But LOOK OUT: Scotland might beat England to the punch. Scottish MPs are discussing a change to Scotland’s own assisted suicide laws. And Scottish MP Margo MacDonald is leading a fierce charge. Posted by John in Death + Crime, Death + the Law, Death Ethics, Suicide and tagged assisted dying, bioethics, death with dignity, Dignitas, Edward and Joan Downes. Bookmark the permalink. ← DeathRef Skelly Approaches Kindle Fame!